A traditional dish slightly revisited. Dangerous. I am not quite sure how to start this post. I’m excited but also a bit scared. I just hope my friends from Rome are going to forgive me for revisiting such a traditional recipe. You know, us Italians.. We are a bit fussy about people taking our traditions and proposing “new versions” while it’s plain as day they are simply, repeatedly stabbing them to death. However, we must remember Italy is a cluster of circumscribed culinary practices, where a dish has a thousand facets. We may even say there is no right or wrong – apart from chicken on pizza or carbonara with cream, which, to my opinion, should be made illegal. Going back to our lamb – or abbacchio, like the Romans call it. I am not a big fan of this meat because of its peculiar flavour. However, I do enjoy it when properly seasoned, reducing the hint of wild. This is a typical Easter recipe from Lazio and it’s usually made with lamb chops. It’s fairly simple and takes very little of your time. I used prime Welsh lamb steaks I had on hand. As I said before, lamb wouldn’t be my first choice and I thought this could be a good idea to use up our little stock. It came out deliciously juicy and flavoursome. Using a mortar, make a paste with two teaspoons of rosemary leaves, 2 garlic cloves and 2 anchovy fillets. Steer in one tablespoon of olive oil to create a creamy sauce. 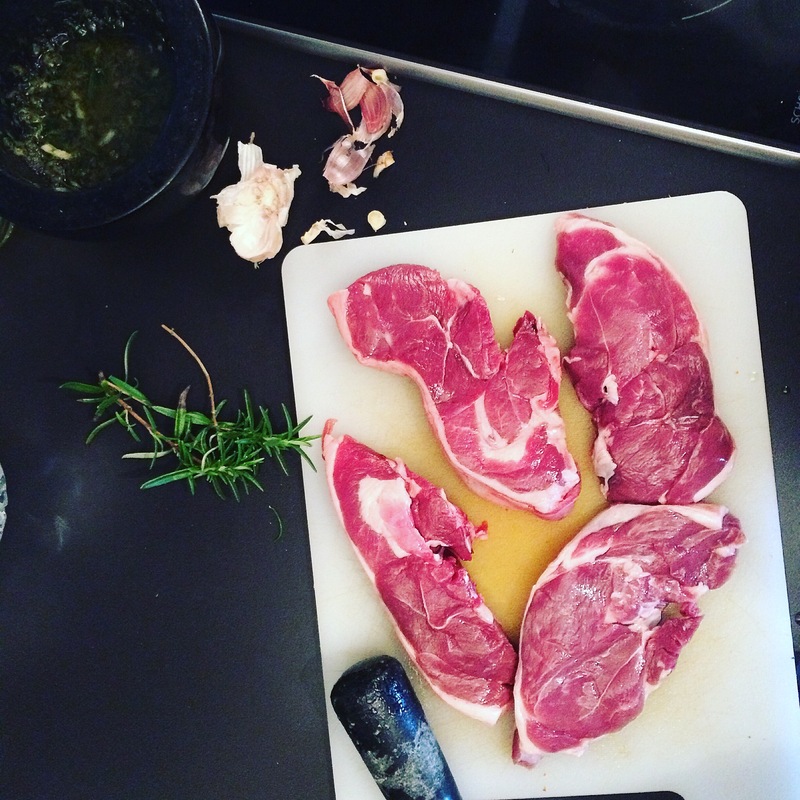 Cut the lamb steaks in large chunks and place them in a resealable bag. Pour in the sauce and massage to coat the meat well. Leave to marinate for 30′ at least (I left it in the fridge for three hours). Heat some olive oil, a halved garlic clove and a fresh rosemary spring in a pan. Sear the lamb for a few minutes, season well with salt and pepper, add half a glass of white wine and let evaporate. Place in the oven at 180°C, cover with a lid or tin foil and cook for 30′. The meat should not dry up. However, if it happens, add half a glass of tepid water diluted with a teaspoon of vinegar. While the lamb is cooking, make a second paste. Although, this time, only use 1 garlic clove, 1 spring of fresh rosemary and 1 anchovy fillet. Mix in one teaspoon of vinegar to obtain a creamy sauce. Add it to the lamb and cook for an extra five minutes. …and never leave the sauce behind!